A job posting on GTJobs goes so much further. 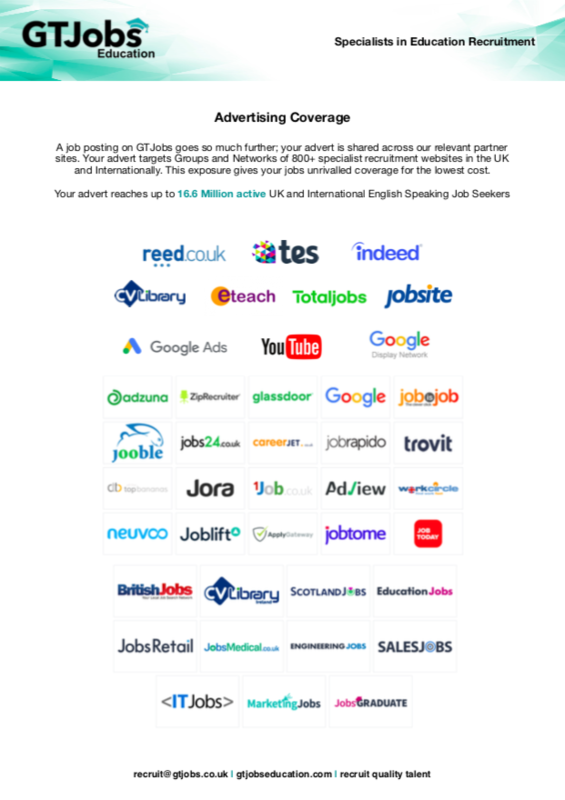 Your advert is shared by our specialists to teachers across our network of 800+ specialist education and recruitment websites in the UK and Internationally. See network examples here. This exposure gives your adverts care, attention and unrivalled coverage at the lowest cost. Or buy as a bundle to save! “Head and governors thrilled at the success we’ve had since moving to your recruitment strategy. It’s changed our staff profile no end. It’s been amazing. “GTJobs has been crucial in assisting with ideas in terms of hard to fill vacancies, have in-depth local and national knowledge and understand the education sector’s audience inside out. Their expertise is of incredible value. “I’m delighted that I can advertise through you. “Thank you again for your help and advice this past 12 months. “We have benefited from the knowledge, wisdom and guidance offered during every recruitment campaign. “Some feedback for GTJobs… it is not often you can have an intelligent conversation with agencies who know their client, know the role they are recruiting for infinitely and sound like they really care. Well done GTJobs I am really impressed. Thank you. This is your 'digital head hunting' strategy that places your role far ahead of the competition tracking down your candidates online.